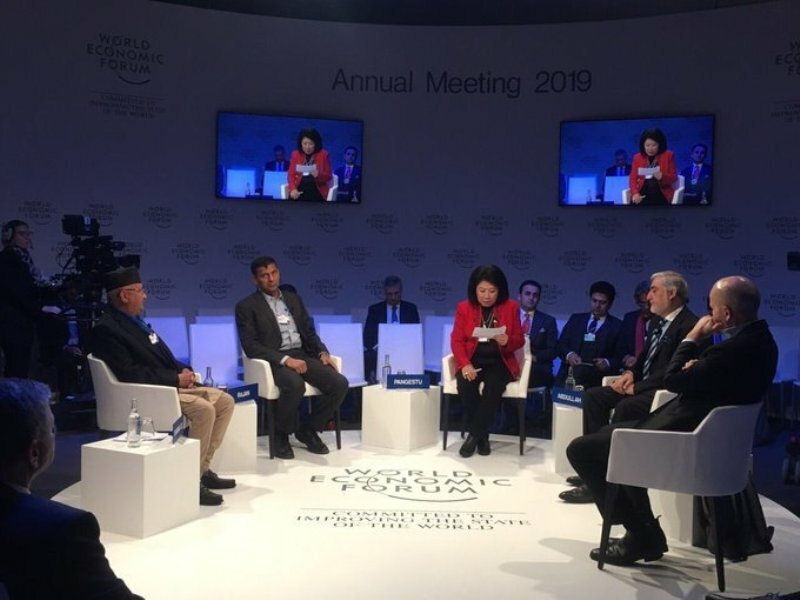 Davos ,Switzerland– The annual meeting of the World Economic Forum (WEF), 2019 kicked off on January 22, Tuesday in Davos as a mega meet of world leaders in politics and business, economists, technical human resources, researchers and civil society leaders. People concerned across the world have assembled here to discuss the ‘best possible’ ways to improve the world’s economy notwithstanding the -10 degrees temperature of Davos which is now thickly blanketed by snow. Some 3,000 high level representatives from around 100 countries across the world are now putting their heads together to come up with effective and expected measures capable of improving the world’s economic status. All the hotels in Davos Klosters City, home to a population of just 11,000, are now packed with guests from across the world. Forum founder and incumbent executive chairman Klaus Schwab welcomed all the guests to the annual meet. On the occasion, he spoke of the need of countering adverse situations facing the world collectively. He insisted on the need of collaborative efforts to tackle consequences of climate change, to reduce poverty and to ensure children’s right to education. Switzerland President Ueli Maurer expressed his belief that mutual cooperation sans discriminations would help tackle the world’s problems. In the inaugural session, Microsoft Company executive chief Satya Nadella, world popular faces in public sector and successful youths shared their experiences with the gathering. They were of the view that localisation would support the globalization. Basima Abdulrahman, David Aristizabal, Nura Beruwa, Julia Luscombe, Mohamed Hassan Mohamud, Satya Nadella and Akira Sakano who co-chaired the session narrated their stories of their success and presented their views about how we could contribute from the respective sides to change the face of the world. Prime Minister KP Sharma is leading the Nepali delegation to the event. This is the first prime-ministerial level visit from Nepal to the event. His entourage comprises his spouse Ms Radhika Shakya; Minister for Foreign Affairs Pradeep Kumar Gyawali; Finance Minister Dr Yuba Raj Khatiwada; Prime Minister’s chief political advisor Bishnu Rimal, foreign affairs advisor Dr Rajan Bhattari and Secretary at the Foreign Ministry Shankar Das Bairagi. On the event venue, the Prime Minister held a meeting with Swiss former President Alain Berset who, on the occasion, according to the Prime Minister recalled their previous meeting in New York. After the event, Prime Minister Oli took part in a panel discussion with the theme of 'South Asia: a strategic vision'. When asked how Nepal is pursuing the course of changes and prosperity following the country having gone through various political upheavals, and peace process and construction writing, the PM said the country is advancing with a goal of achieving 'Prosperous Nepal, Happy Nepalis' while further consolidating relations with neighbouring India and China. Thereafter, PM Oli in his interview with DW-TV of Germany and CCTV News of China informed about policies and programmes adopted by Nepal to achieve goals of country's development, economic growth and prosperity. Likewise, Finance Minister Dr Khatiwada participated in discussions with the office bearers of the United Nations Conference on Trade and Development. On the occasion, the minister expressed his sadness over decreasing foreign investment in the country. He stressed the need for changing investment process, and providing ownership to local people by distributing them their investment share. He also sought for involving government and private and donor agencies, and creating a new investment model. The conversations were also attended by James Zhan, Senior Director of Investment and Enterprise at the UNCTAD. ‘Globalisation 4.0: Shaping a Global Architecture in the Age of the Fourth Industrial Revolution’ is the theme of the meet. The event will conclude on coming January 25, Friday.